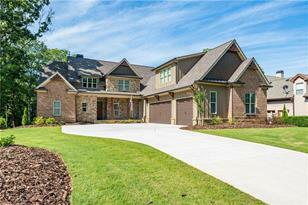 Stunning home in Traditions of Braselton Golf Community. Incredible views of the 13th and 14th Greens, Main Level offers open flow with Gourmet Kitchen, Surround Sound. Master Suite offers a spacious living and bathroom area which includes a zero entry shower. Upstairs Features three bedroom suites and an office. Basement is mostly finished leaving some space for storage, large living/recreation room. An screened porch offers views of the golf course, Ramada and swimming pool with hot tub, water falls and bar stools. Owner has invested over $400,000 in upgrades. 2139 Saddle Creek Drive, Jefferson, GA 30549 (MLS# 6510800) is a Single Family property with 7 bedrooms and 6 full bathrooms. 2139 Saddle Creek Drive is currently listed for $849,900 and was received on February 26, 2019. Want to learn more about 2139 Saddle Creek Drive? Do you have questions about finding other Single Family real estate for sale in Jefferson? You can browse all Jefferson real estate or contact a Coldwell Banker agent to request more information.